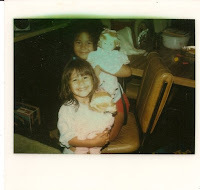 For the last two weeks, I've been thoroughly consumed by preparations for my cousin's wedding, thus TOTALLY ignoring my blog (She and I as children, pictured to the left). Saturday, July 11th is the special day and the festivities will take place in Columbus, Georgia. She selected me to be one of two Matrons of Honor. This is only the third wedding I've been asked to be in. The first was as a flower girl for my aunt (whose marriage dissolved last year). I was 9? Second was for my older brothers wedding. Hated the dress and the hair but I made it through the day. For this wedding, I got to select my dress. I absolutely love how it looks on me. We'll see if the camera will be kind. The other matron of honor and I have been teasing the bride, BRIDEZILLA. (Bride and I, all grown up, pictured to the right.) She's not that bad but she does have a specific design for the festivities, as any bride does. I'm thoroughly excited for her and have to hastily prepare a "toast". So excuse me, as I use this blog as my drawing board for the toast... then you can be the judge and tell me what sounds good. Awwww you guys are so cute in the pictures especially in the first one. I'm really excited for her too. I was thinking of her the other day and I thought it was strange because it was just ottah the blue. Her name is actually on our ward roster and I was wondering if it was her or another girl. She's grown up to be such a beautiful young woman!